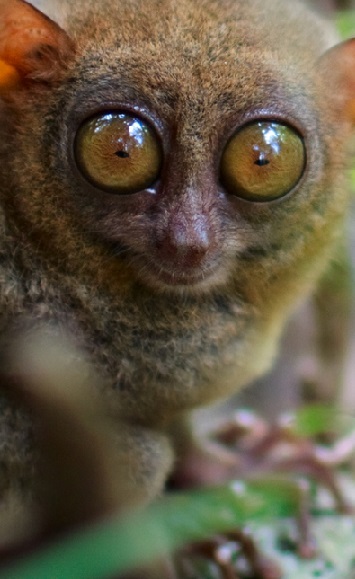 One of the particularly cool tarsier facts, is that each one of their enormous eyes actually weighs more than their brain! 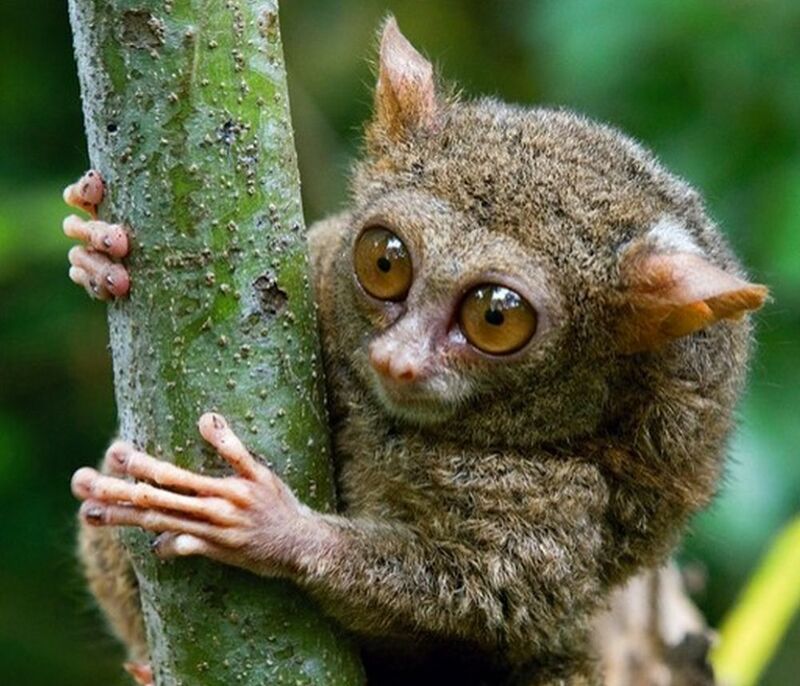 The tarsier is a tiny primate with a whole bunch of unique characteristics, and a fossil history that dates back 50 million years. It is a spectacular looking little animal, with enormous eyes, a delicate, elf-like nose and a sweet grin. They have expressive hands and fingers, and freakishly long hind legs folded up under their bellies. Most of us have only seen them static, frozen in a photo, or a meme, like a fuzzy brown tennis ball, clinging to a reed. The coiled position they are most often photographed in, makes them look round, maybe even a little plump, however the tarsier is actually a slender, lean athlete, with the longest legs relative to total body size of any animal on Earth. 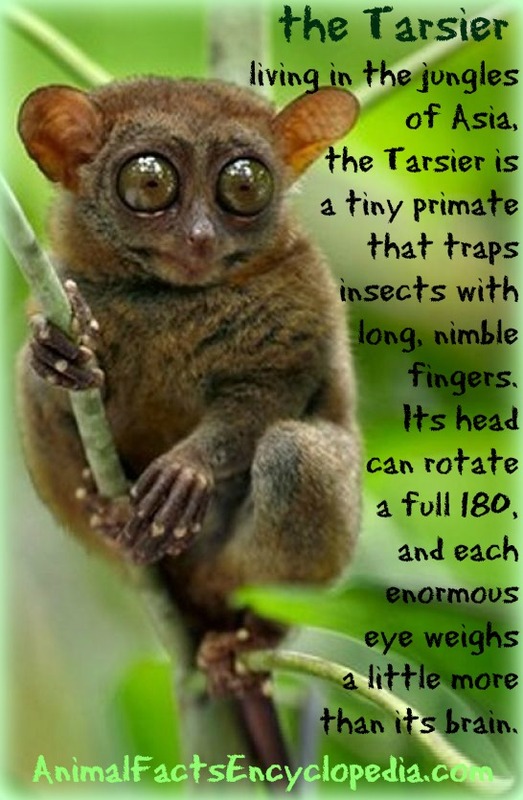 The tarsier is one of the smallest primates, most certainly one of the oldest, and also the only primate that is completely carnivorous. They spend the night hunting for insects, and the occasional reptile or tiny bird, and journey through the forest by springing from tree to tree, using their incredible legs to jump up to 15 feet in one shot, or practically 30 times their body length. The tarsiers body proportions are similar to that of a kangaroo, with shorter front limbs and stretched out hind legs, but in the kangaroo it is mostly the shin - the tibia and the fibula bones - that are elongated. In the tarsier it is the calcaneum and navicular bones of the ankle, also known as the tarsal bones, that are freakishly long, and this is actually where the name tarsier comes from. 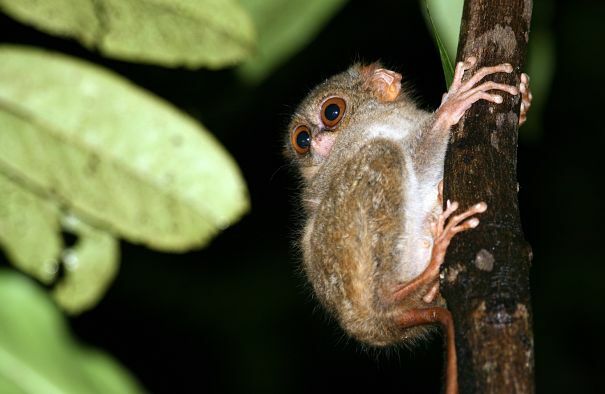 On the ground, the tarsier hops like a frog, but can also move with a quadrupedal walk. They are usually on the ground for just a few moments while they trap and eat an insect or two, then return to the trees. The hands and feet have tiny, rounded tips, like suction cups. The thumb is not opposable, but the big toe is, and the hind foot is able to rotate drastically to allow grasping of branches in a variety of positions. There are flattened nails on all fingers and toes except the third and fourth toes, which have long, curved claws designed specifically for grooming. 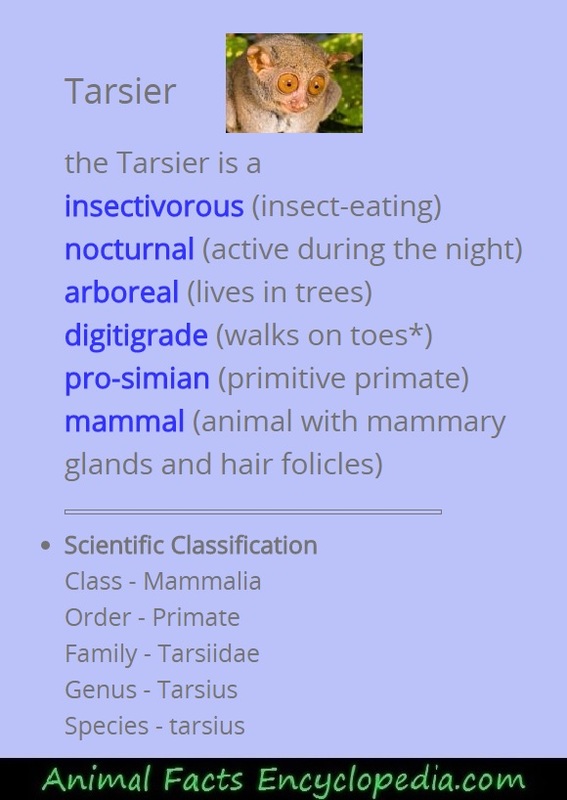 There is lots of confusion and discussion about where to place tarsiers on the primate family tree.. The question is whether they are prosimians, which is how they were originally classified, or apes. 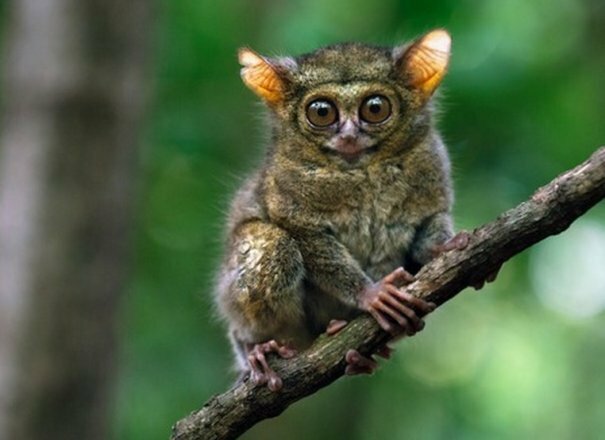 Although they look allot like the prosimian lemurs, lorises and bush babys, and have some similar traits like grooming claws and a nocturnal lifestyle, they actually have many more features of apes. 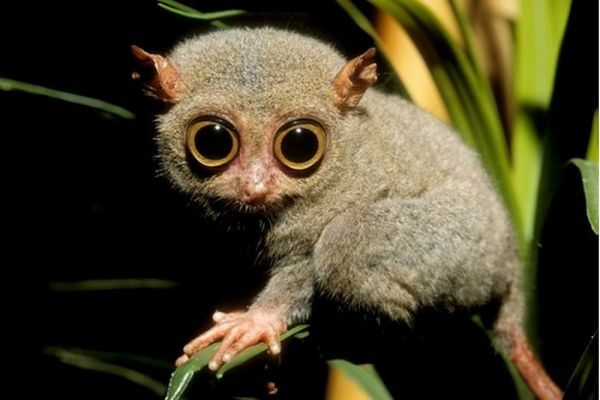 Just like apes, tarsiers lack a rhinarium, which is the exposed, wet surface around the nostrils found in most mammals, (think of a dog nose), and they don't have the reflective layer in the eye called the tapetum lucidum, that makes many animals eyes glow in the dark. There are aspects of skull structure and dentition that also point to them being more like apes. So in recent years, they have been classified in their own infraorder, with their own family, between these two branches of primates, and are not considered monkeys. 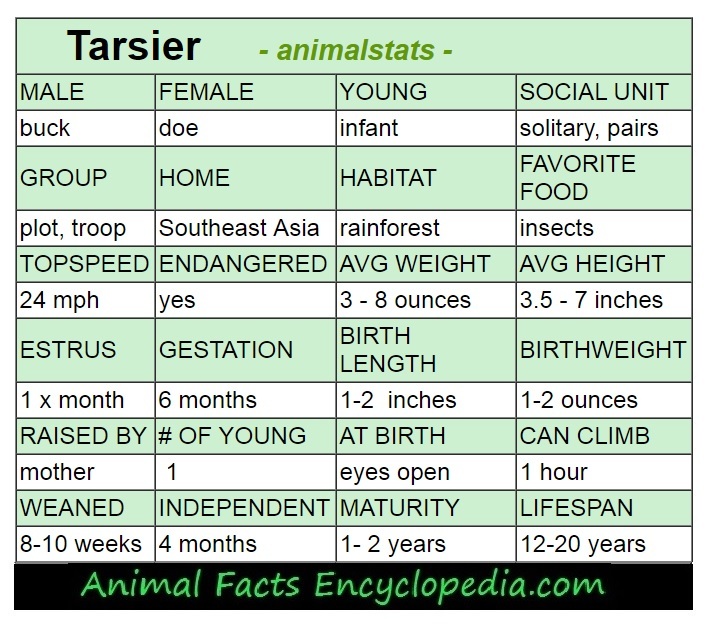 But the tarsier has been around for millions more years than any of these other primates and shows no evolutionary link to them. 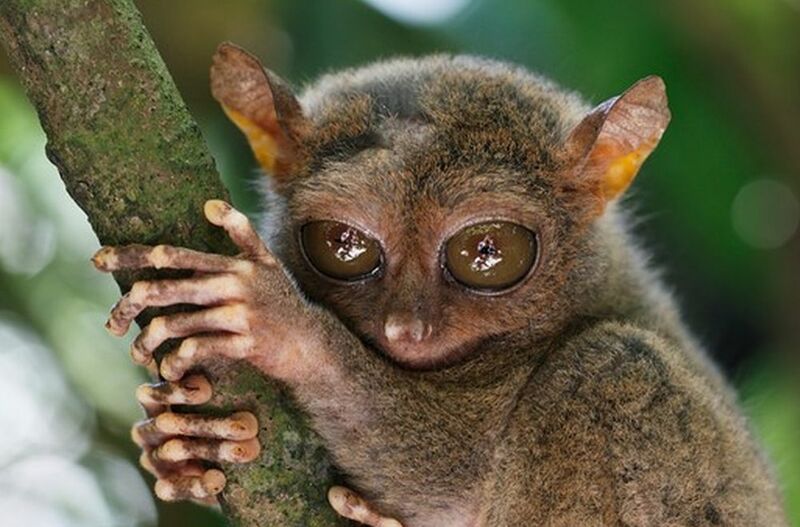 In facts, the tarsier just seemed to spring out of the Miocene age without any clear connection to any other creatures. 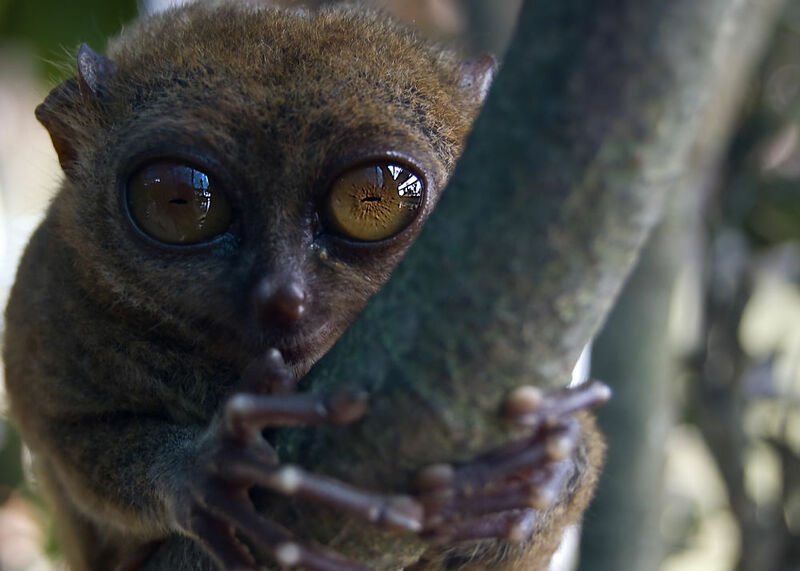 The first fossil record of the tarsier, is a 50 million year old tarsier, and other than growing a bit smaller, they simply haven't changed that much. This has led many to point to the tarsier as an example of creationism, since science can't even begin to offer an explanation not just of who they are related to, but where they came from in the first place. 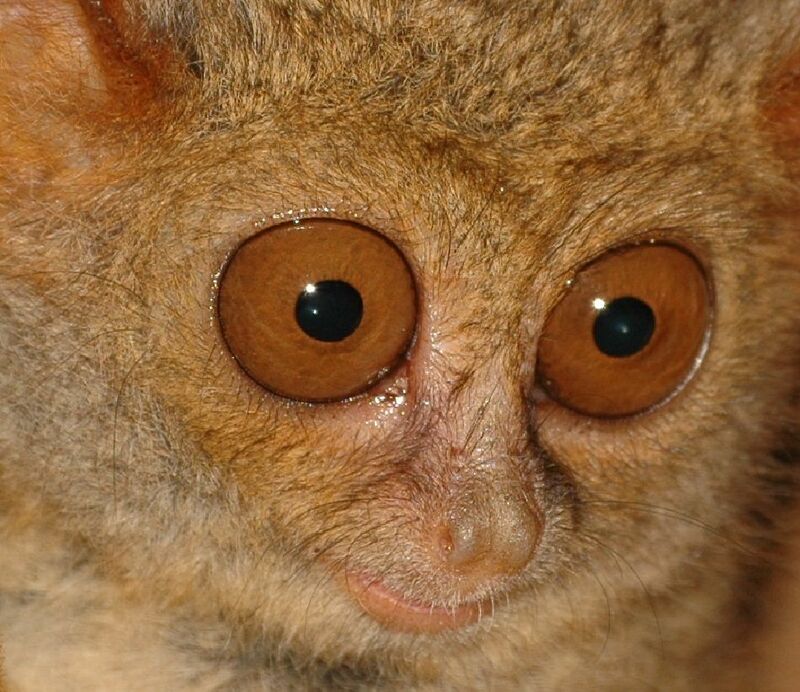 Tarsier species have different breeding habits, but generally the female comes into estrus once a month. Many of these animals appear to be monogamous, mating for life and living in little groups that include a few offspring. Some species seem to be more solitary, getting together at some point during the day, but otherwise eating and sleeping alone. The female is pregnant for about 6 months and gives birth to a single infant that is about 1/3 her size. That's about the same as a woman who weighs 120 pounds, giving birth to a 40 pound infant! The baby is born eyes open and furred, but takes a few days to gain mobility. Tarsier mothers "park" their babies on a tree limb, since they are too large to carry around, and hunt a few feet away. In some species, males play a minor role, keeping closer when there is an infant present, and providing some defense from predators. 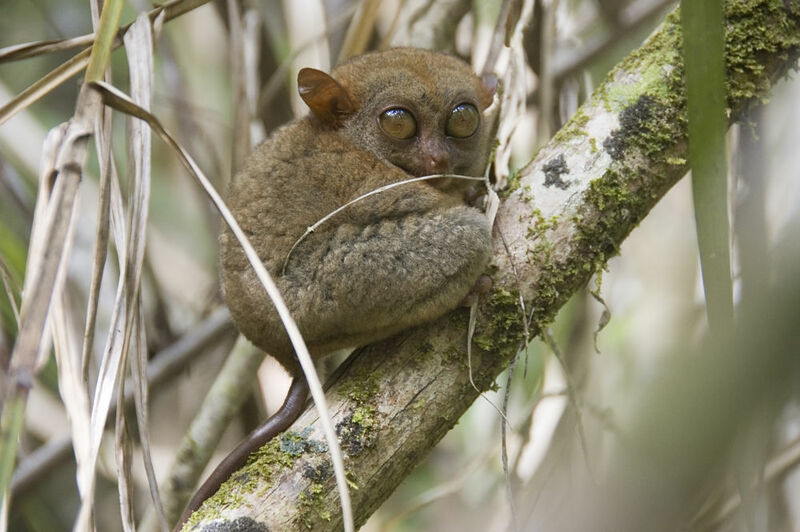 Tarsiers have been observed to "mob" predators such as snakes, with up to 10 individuals coming together for coordinated attacks, leaping towards and striking at the intruder. A males prowess during these displays may make him more desirable to mate with.